The superfluid response of helium-4 inside a narrow pore depends on the type of boundary motion: longitudinal vs. rotational. Complex Materials REU Program a Success! Consider an experiment where one draws liquid through a straw by applying a pressure difference between its ends. This is equivalent to opening up a faucet, and the flow across the straw will depend on its size as well as the nature of the atoms making up the fluid inside it. Next, decrease the temperature to near absolute zero, so that the interactions between particles in the straw are dictated by the rules of quantum mechanics. At such low temperature, only a liquid of helium is known to exist, because its quantum motion prevents any solidification. This liquid is known as a "superfluid" because it can flow across the straw without any viscosity (friction) regardless of the its length. How would the superfluid of helium change if the diameter of the straw was reduced to the size of a single atom? In this nanoscale limit, the atoms will be forced to queue up, one-by-one as they move through the straw and the enhanced interactions may lead to exciting changes in the properties of the fluid. To investigate this nanoscale regime, an international team of researchers led by Prof. Del Maestro at UVM has performed a numerical experiment requiring thirty years of computer processing time to measure the superfluid properties of a liquid of helium flowing through and around straws of roughly 10 nm length and 1-3 nm in diameter. 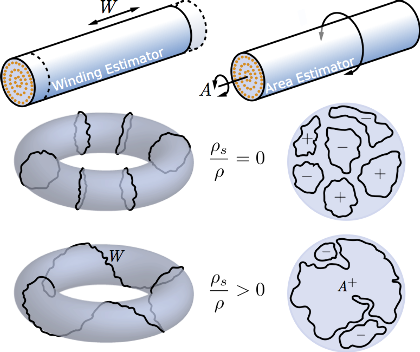 Remarkably, in their work published this week in Physical Review B, they have demonstrated that in the core the straw, the atoms can flow without viscosity, but in a way that is distinct from superflow in wider three dimensional straws. Instead, the core behaves as a special type of cooperative one dimensional quantum fluid known as a Luttinger liquid. The next step will be the experimental observation of a Luttinger liquid of helium and recent advances in nanotechnology combined with insights from Prof. Del Maestro's simulations may make this a reality in the near future.